So it’s over. Another season in the books. If you want to hear our thoughts on last night’s title game, check out our post from afterward. Briefly though, congrats to Connecticut, who played a phenomenal game making all of its free throws and making key shots when they needed to. On the other side of the ball, Kentucky made the plays they needed to stay in the game, but couldn’t make the shot that would put them over the top and never actually led in the game. In fact, they were never tied except when it was 0-0. Oh, and those free throws. Again for a Calipari team. We will have more on the season later this week as we recap the season. The immediate future of Manhattan basketball will be determined over the next few months in Lexington as Manhattan announced that it would welcome disgraced coach Steve Masiello back to his head coaching job after he receives his degree from Kentucky. The school has decided to frame Masiello’s deceit about his education as poor judgement rather than a lie. While that might be considered as forgiving it is worth noting that the school would not be able to get a coach of Masiello’s caliber if they didn’t take Masiello back. We are not sure what it is about South Florida that draws former NBA players and coaches to coach lower-tier teams, but we are up to two in the past five years as Florida Atlantic hired Michael Curry to be its next coach. Curry played in the NBA for 11 years and coached the Detroit Pistons for one season where he went 39-43 before being fired. Curry does not have any other head coaching experience, but apparently that was enough to beat out LaVelle Morton and Matt McCall for the job. Hopefully, Curry will have more success in South Florida than the last head coach with NBA experience (Isiah Thomas at FIU) had there. The Naismith Memorial Basketball Hall of Fame announced its 10-member class of 2014 yesterday. The headliners for college basketball fans are Gary Williams and Nolan Richardson with Alonzo Mourning and to a lesser degree Mitch Richmond. The resumes of the first three on the college level does not need much explaining, but perhaps Richmond’s does since we noticed that the college part of his Wikipedia entry had been left blank so this might be a useful primer. The induction ceremonies will be held from August 7-9 in Springfield, Massachusetts. We have probably seen the last of Oregon guard Johnathan Loyd on the basketball court (at least if you don’t want to watch overseas basketball), but we could see him in an Oregon jersey this fall except this time he will be a wide receiver on the Oregon football team. Thanks to a NCAA rule allowing a player to compete for a fifth year if it is in a different sport (remember Greg Paulus at Syracuse) Loyd would have another year of eligibility. Normally we would worry about how someone of Loyd’s size would survive on a football field, but perhaps Oregon’s up-tempo style might help him. I’m going to miss Maryland, especially the rivalries with UNC and Duke. I think it’s a good move for them, the ACC is about to get too tough for them in basketball and football.” – Longtime North Carolina fan and ACC Tournament attendee Kevin Armwood. And so it is over. After 61 years in the league, Maryland has played its final ACC Tournament game. The end came suddenly on a Boris Bojanovsky dunk with less than a second to play, lifting ninth-seeded Florida State over the eighth-seeded Terrapins on Thursday afternoon, 67-65. Maryland put up a game effort, coming back from an 11-point second half deficit to tie the game at 63 with under two minutes to play. But just like so many times during this season, the Terrapins once again couldn’t close the deal. The end came so swiftly that the rest of the ACC fans in the building didn’t have a chance to taunt the Maryland group on their way out of the building (and the conference). 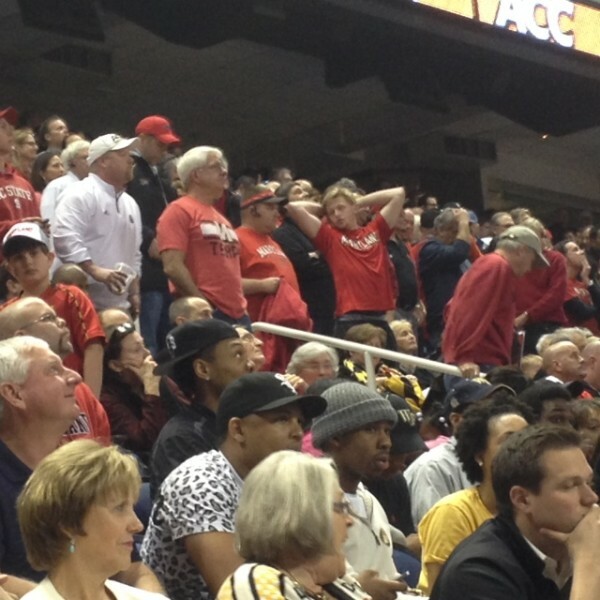 Maryland Fans React to Loss in Final ACC Tournament for the Terrapins. 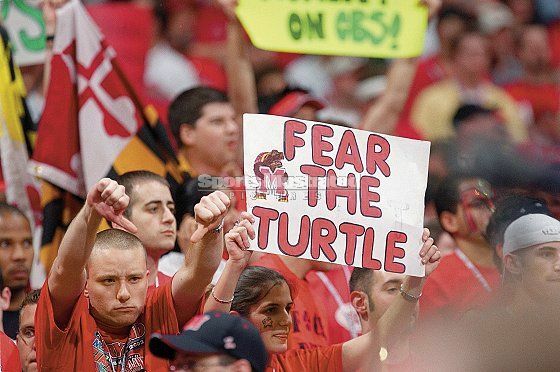 Certainly Terrapins fans have some mixed emotions regarding the school’s move to the Big Ten next year. There has always been the feeling among Maryland faithful that the ACC Tournament was an uphill battle for their school, particularly when it was held in the state of North Carolina (as it always seemed to be). So it’s fitting that Maryland’s last go-round in the grand-daddy of conference tourneys took place in Greensboro. After today’s loss, Maryland finishes its ACC tenure with a slightly lower winning percentage in ACC Tournament play (45.2%) than in its ACC regular season games (50.7%). Perhaps ironically, or perhaps just an artifact of sample size, the Terrapins have a better all-time tournament record in Greensboro (26-23) than in the four seasons when the event took place in the Washington, D.C., area (3-4). All three of Maryland’s ACC Championships were won in the Tar Heel State, with two of those net-cutting ceremonies taking place in Greensboro, the last in 2004 when Gary Williams led the Terps past arch-nemesis Duke. Of course, the most famous Maryland ACC Tournament moment came in the 1974 championship game overtime loss to N.C. State that kept the Terrapins out of the NCAA Tournament despite ranking in the top five of the polls all season long. Saturday night’s Maryland loss at Duke closes a historic chapter in ACC basketball history. It marks the Terrapins’ last visit as an ACC member to the Triangle area, long considered the heart of the conference (just ask Gary Williams). That game, a two-point loss in Cameron Indoor Stadium, seems like an appropriate last act in a long-running drama that has been playing since the formation of the ACC in 1953. Duke’s victory had many of the same elements that these games have had for years — specifically, a hard-fought, passionate contest with questionable officiating that ultimately resulted in another frustrating loss for the Terps. 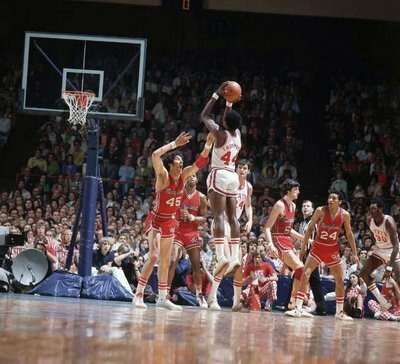 The 1974 Maryland-N.C. State ACC Championship Game Sparked Changes To The NCAA Tourney. Maryland fans have long expressed the feeling that their team just couldn’t get a fair shake on Tobacco Road. Check out this game recap from a 1974 Maryland-N.C. State game in Raleigh. Near the end of the article, Terrapins’ head coach Lefty Driesell is quoted as follows: “My complaint is the charging calls against us,” Driesell said. “I’m not saying the calls were wrong but it’s only called that way in this part of the country.” He is certainly not alone in thinking that Maryland was at a distinct disadvantage when playing conference games in the Tar Heel State, whether they were on a rivals’ home courts or in the frequent ACC Tournaments held in Greensboro or Charlotte. As Maryland prepares to join the Big Ten next season, let’s take a look at some of the other memories that Maryland will be leaving behind. Maryland was a charter member when the ACC formed prior to the 1953-54 basketball season. Although the Terrapins captured an ACC title in 1958, it wasn’t until the fiery Driesell arrived prior to the 1969-70 campaign that Maryland basketball became nationally relevant. At the time, North Carolina and N.C. State were the top programs in the league, but Maryland quickly joined them and produced some classic games that had a major influence on the rising popularity of the sport. In 1973, the ACC and its TV broadcast partner, C.D. Chesley, decided to go big with the N.C. State – Maryland game in College Park as a prelude for sports fans to the NFL’s Super Bowl Sunday showcase event. The 87-85 win for David Thompson‘s Wolfpack in front of a nationally-televised audience was a highly entertaining game that helped push the reputation of the ACC as the best and most exciting hoops conference in the country. Testudo Times: I admittedly don’t know a whole lot about what qualifications earns a coach a spot in the Hall of Fame, but put me down for Gary Williams regardless. Some of the reasons are here, courtesy of Dave Tucker: he won a national championship in the second of back-to-back Final Four appearances; his teams went to 11 straight NCAA Tournaments; and he has the third most ACC wins behind Coach K and Dean Smith. Also of note is how he rebuilt Maryland from the ground up after the school was (arguably unjustly) leveled with NCAA sanctions. Seems like an open-and-shut case to me. Baltimore Sun: Devin Thomas‘s older sister Alyssa is one of Maryland’s best players ever. She also may have played a role in Devin becoming the interior force we now know by beating him in one-on-one as kids (she was faster, so he had to get physical). More interesting is that Thomas almost joined his sister at Maryland until Gary Williams retired and the coach in charge of his recruitment left. Think about a Charles Mitchell – Devin Thomas frontcourt. Hello 100% rebounding rate. Blue Devil Lair: Here’s a look at some efficiency stats that suggest Duke is on track for the Final Four. Duke and Creighton sit in elite efficiency territory and are doing it essentially with offense alone. That’s probably the most interesting part of the equation, as while teams with gaudy efficiency differentials tend to make the final weekend, it generally takes a more balanced team than the Bluejays or Blue Devils to get those margins. What’s also worth noting is that efficiency margins are likely to drop as the season progresses (and the teams you play get better), so Duke’s numbers may be inflated compared with what they’ll look like at the end of the season. Hampton Roads Pilot: Speaking of teams with gaudy efficiency stats, Virginia will almost certainly retain its top spot in Tuesday Truths today. Which begs to question. Just what happened at Tennessee? Was it a wake-up call? An outlier of all outliers (on both ends of the floor)? A horrible match0up? We’ll never know, but that game makes many people very wary of Virginia as a top tier team in the ACC. Beating Syracuse March 1 would go a long way in easing people’s doubts (and could lock up the regular season “title”), but I’m not sure I’ll ever get past that beatdown. Syracuse Post-Standard: Interesting interview from Donna Ditota with Jim Boeheim. While he opens by acknowledging Syracuse’s vulnerability, it’s clear Boeheim has very positive feelings about this team. He noted Baye Moussa Keita’s injury might turn out to be a blessing, as it’s helped Rakeem Christmas accept a bigger role. And then he broaches winning a national championship with limited depth, which–while a natural response to a question on depth–bears significance because of Boeheim’s normal self-deprecating tone. EXTRA: Duke conspiracy theorists have more ammo, as the conference announced the official did make a mistake in the second half of the eventual 1-point Blue Devil win against Maryland. Drexel appeared to be on the verge of putting together an excellent season as they started 4-2 with their only losses being close games against Arizona (four-point margin) and UCLA (five-point margin), but their hopes for being a March sleeper took a huge hit yesterday when they announced that Damion Lee, their leading scorer last season at 17.1 points per game, was out for the season after suffering a torn anterior cruciate ligament in his right knee. Lee sustained the injury in the second half of the team’s loss to Arizona, a game in which the Dragons held a 19-point lead at one time. This is the second straight season that Drexel has lost a significant player to a season-ending injury as last year they lost Chris Fouch to a season-ending knee injury as well (Fouch is playing as a sixth-year senior now). It appears that Drexel was not the only team to lose a significant player to a knee injury over Thanksgiving break as Houston announced that sophomore guard Danuel House would be out indefinitely after undergoing arthroscopic knee surgery. Unlike Lee, House is expected to return this season although the school did not set a timetable for his return. The injury is still a big blow as House was averaging 15.6 points and 5.7 rebounds per game this season albeit while shooting an atrocious 37.9% from the field. Fortunately for the Cougars, they do have a relatively light stretch before their schedule gets noticeably tougher starting on New Year’s Eve when they face Connecticut. Despite their tough loss at Connecticut last night Florida appears to have the pieces to make be a legitimate Final Four threat if they can get everybody healthy and on the court at the same time. It is beginning to look more and more like that will not be the case. While they are still waiting to hear back about some major eligibility and injury issues, it appears that they will redshirt Rutgers transfer Eli Carter who is still recovering from a broken leg. Although the injury occurred in February, Carter, who was averaging 14.9 points per game at Rutgers before the injury, has played sparingly for the Gators this season as he has only played 53 minutes this season. The loss might be considered a big blow for the Gators who are now looking for a point guard after Scottie Wilbekin went down with a knee injury late in the loss last night, but the decision to redshirt Carter should not come as a surprise to those who have followed his recovery. We finally have a break in the North Carolina academic fraud scandal and someone has been charged with a felony for his actions. No, it is not an administrator. Instead, it is Julius Nyang’Oro, the former chairman of the much-maligned Department of African and Afro-American Studies at North Carolina. Yesterday, a grand jury indicted Nyang’Oro on a single felony count of obtaining property under false pretenses for accepting $12,000 for a course that had no classes. According to the university, the were able to recoup the money in his final paycheck. If convicted, Nyang’Oro faces up to 30 months in prison [Ed. Note: The AP story says 10 months.] so perhaps the most interesting aspect of the case will be if he tries to work out a deal with the prosecution to testify against the school and/or administrators being complicit in the fraud as a means to avoid jail time. Usually when Gary Parrish publishes a Poll Attack it typically features a writer we have either never heard of or are simply unfamiliar with. This week is a little different as he uses the space to inform us that an individual we are very familiar with, former Maryland coach Gary Williams, has an AP vote. We had heard about Williams’ new job working with Comcast Sports Network, but we had no idea that he had received a vote basically at the same time he started his new job. Unfortunately, Williams appears to have missed the results of Xavier’s games and Memphis’ victory over Oklahoma State, but like Parrish we will give Williams a break since he is new to this. I. Renko is an RTC correspondent based in D.C. and the author of the weekly column, The Other 26. He filed this report after Wednesday night’s game between North Carolina and Maryland. Follow him on Twitter @IRenkoHoops. One Team is Dancing, and the Other Is (Probably) Not — This was UNC’s sixth straight win and clinched a share of third place in the ACC. The Tar Heels’ recent run, which includes victories over Virginia and NC State, has solidified their hold on an at-large bid. A win over Duke on Saturday would leave no doubt, but even a loss followed by another in the first round of the ACC Tournament should not jeopardize their at-large hopes. Maryland, on the other hand, is headed in the opposite direction. The Terps badly needed this win after recent losses at Boston College and Georgia Tech. Without it, they’ll probably need to beat Virginia on Saturday and make a deep run in the ACC Tournament to have a shot. McAdoo vs. Len Disappoints — The marquee match-up coming into the game was the battle between big men James Michael McAdoo and Alex Len, but it proved to be a disappointment. Len excited the crowd with some putbacks, but both players looked tentative and ineffective trying to create offense. McAdoo finished with 10 points and two rebounds. Len added just eight points. To some extent, the letdown was a microcosm for their seasons. Both players entered the year with high expectations — perhaps unfairly high — that they haven’t quite matched. McAdoo was in early National Player of the Year conversations, but has drifted well out of the NPOY race as well as NBA Draft lottery projections. Len remains a projected lottery pick, but he has struggled down the stretch, scoring in single digits in seven of last 11 games (after scoring in double digits in 15 of his first 18 games). I don’t pretend to be a draft expert, but one has to wonder if we may see both of these guys back in college uniforms come November. Maryland’s Shooting Woes Continue — UNC offered a great chance for Maryland to break out of its outside shooting slump, as the Tar Heels’ defense is vulnerable to the three-point shot. And, sure enough, the Terps had plenty of good looks, particularly off post kickouts and ball reversals. But they couldn’t capitalize, shooting an ugly 3-of-23 from behind the arc. They are now shooting 17.9 percent from three over their last three games and 27.3 percent over their past six. The Terps tried to compensate for their woeful shooting against UNC by pounding the offensive glass and attacking the paint. They were effective, outscoring the Heels in the paint, 38-16, and on second-chance points, 20-11. But they still lost the game by 11 points, thanks to their disastrous night from outside. I. Renko is an RTC correspondent based in D.C. and the author of the weekly column, The Other 26. He filed this report after Saturday afternoon’s game between Maryland and Clemson. Follow him on Twitter @IRenkoHoops. Maryland’s Tournament Hopes Are Alive — Last weekend’s win over Duke gave the Terps’ Tournament hopes a big boost, but a letdown loss at Boston College on Tuesday left them on the thinnest of ice. A loss to Clemson at home would have been a big blow, and it seemed a real possibility when the Tigers pulled to within a point just after halftime. But a 21-6 run gave the Terps a comfortable 16-point cushion with 11:20 to play, and from there, they eased to a comfortable 13-point win, keeping their Tournament hopes alive. While acknowledging his team’s somewhat slow start, head coach Mark Turgeon was quite happy with the Terps’ second-half performance, crediting their defense even more than their offense for enabling them to take control. Maryland’s Freshman Frontcourt May Be Its Future — Sophomore Alex Len has been the focus of the media’s attention for most of the year, but Maryland’s freshmen frontcourt shows signs of being a real force for years to come. Jake Layman, Charles Mitchell, and Shaquille Cleare were averaging just 5.2, 5.5, and 4.2 points coming into today’s game, but they scored 12, 8, and 10 respectively today. More than that, they showed a certain kind of maturity and poise that belied their status as freshmen. The 6′ 8″ Layman is a swing forward with the athleticism, quickness, and shooting touch to play on the perimeter. He has been a full-time starter since late January, and the confidence and skill he displayed against Clemson show why. Mitchell and Cleare are a pair of big bodies who are still refining their post moves, but are strong finishers and rebounders who use their bulk to great effect. They added 6 and 7 boards apiece today and were a big reason Maryland was able to dominate the paint against a typically stout Clemson defense. Their physicality will suit the Terps well when they make the transition to the Big Ten. Clemson’s Offense Is In A Deep Funk — The Tigers have a strong defense, as they showed in taking Miami the distance last week in a 45-43 loss. But their offense has struggled and especially badly of late. This was the fifth straight game in which they scored less than a point per possession. For a team that is likely looking forward to next season already, the news gets worse — two of their three leading scorers, Devin Booker and Milton Jennings, graduate this year. That leaves a heavy load for K.J. McDaniels, who managed seven points against Maryland, and Jordan Roper, who scored a very inefficient 13 points on 5-of-15 FG shooting. Maryland is leaving the ACC to join the Big Ten along with Rutgers. Unsurprisingly the move sparked mixed opinions from all sides. Maryland’s move is the first time since South Carolina left in 1971 that a charter member of the ACC has joined another conference, which says a lot about the current state of college athletics. Objectively–at least in the long run — Maryland’s administration made the obvious decision. The Terrapin athletic department has financially struggled mightily the last few years, and the Big Ten offers significantly more television revenue than the ACC. The caveat is the ACC’s recently negotiated $50 million exit fee (which Maryland and Florida State opposed at the time), a fee so steep will decimate the athletic department’s short-term finances. Look for the ACC to really stick to its guns regarding the exit fee, but Maryland probably won’t pay the full penalty. Contracts require diligence in order to be enforced, and Maryland will probably argue that the massive exit fee is punitive — especially considering the fact that the school didn’t support the massive exit fee hike. That said, if other schools smell instability and see a way around the exit fee, the ACC could be in trouble. If Maryland is forced to pay the full exit fee, the only two feasible options are a massive capital campaign or some sort of assistance from a third party (including the Big Ten). Raleigh News & Observer: After several months of beating his drum, Dan Kane finally found a whistleblower from the North Carolina athletic support staff. Mary Willingham is the first named source to come out and directly say that plagiarism was tolerated by the tutors and professors in many no-show classes at UNC. A witness has been the missing piece to this story, and Willingham’s criticism is damning to say the least. She alleges special treatment for revenue sport athletes, both in terms of admissions and questionable classes. Willingham’s comments will take some further dissection but do not look good for the school at first reading. ESPN: The biggest news over the weekend was the bombshell dropped out of College Park when sources within the athletic department told ESPN that Maryland is far enough along in negotiations to join the Big Ten (along with Rutgers) and that an official announcement could come as soon as later today. This makes the ACC’s recent addition of Notre Dame even more important, though it could also spark additional expansion moves (does Connecticut become an ACC target?). By switching leagues, Maryland would likely see a significant boost in television profits in the long run, but the recently increased $50 million dollar ACC buyout could cripple an athletic department already in the red in the short term. Washington Post (pro and con): Two Maryland legends spoke out for and against the Terps’ potential move to the Big Ten. Gary Williams is all for the move despite supporting the ACC throughout all the expansion rumors. It should be noted that Williams serves as assistant to the athletic director, so it may color his opinion a little (though Williams was never scared to speak his mind before this). He cited the increased television revenue and hinted at a lack of respect from the ACC (noting the conference tournament was only hosted in Washington, DC, once in his 22 years). Len Elmore on the other hand fought for tradition: “Anything that’s driven solely by dollars, it’ll turn out badly.” Elmore took some shots at Maryland’s president and athletic director for not having Maryland pride. Expect more from us here at the ACC microsite on the potential move today. Wilmington Star News: NC State’s Debbie Yow earned herself an extension with increased supplemental compensation. Yow’s new deal runs through June 2017 and is a direct result of a successful coaching search (in hindsight at least) and the steady improvement that the Wolfpack’s athletic teams have seen under her tenure –most prominently, on the basketball court. Yow will continue making $354,000 a year with an extra $150,000 in supplemental earnings and an enhanced bonus structure going forward. Hampton Roads Daily Press: David Teel sat down with John Swofford to talk all things ACC. The majority of the interview is covered in his excellent profile, which ran Sunday. But the extras are also worth reading, especially Swofford’s optimism on merging the Notre Dame and ACC football deals in the near future. He also talked briefly about working above Dean Smith at North Carolina and the ongoing scandal in Chapel Hill.